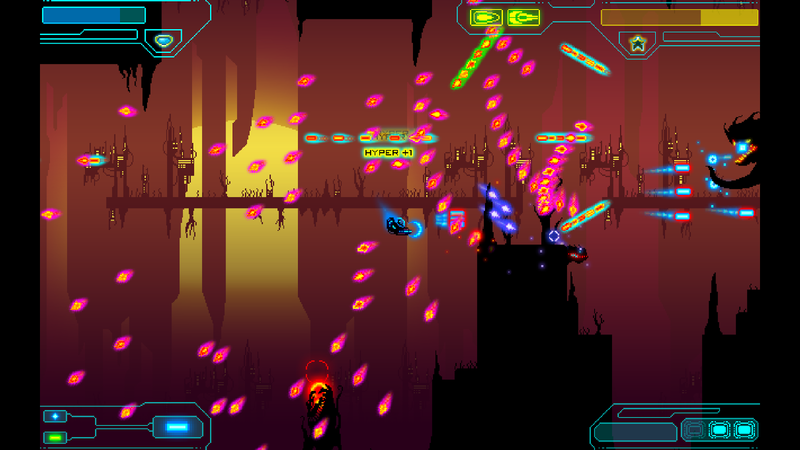 Even though the way the game controls immediately evokes Herocore, zX trades in the metroidvania style world for bite-sized levels, which actually makes it feel more akin to something like Radian Games' Inferno. The game is currently only in a demo state, with a total of 10 stages and 1 section boss, but retroFuture is planning for the final release of zX to have around 60 stages. By that time, however, the scale of the game may have spiraled out of control. Even just in the course of the available levels, you can almost feel the developer increase the scope of the game under your very fingers. 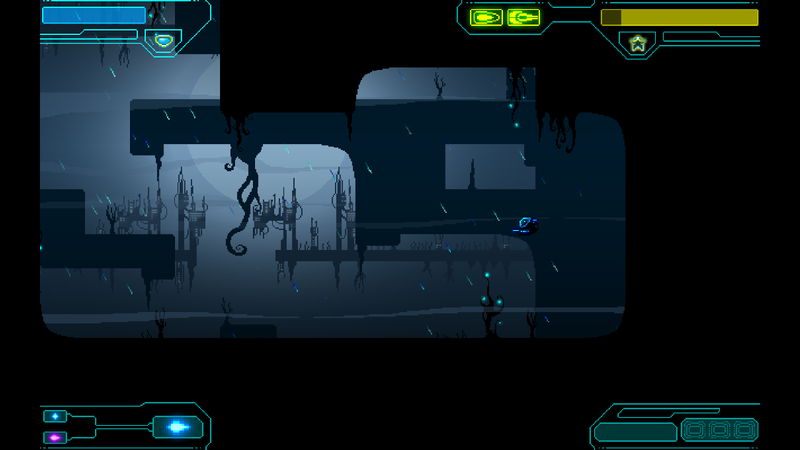 The opening levels are somewhat barren, being just empty, short corridors with a sprinkling of enemies. But by the tenth stage you've seen a variety of enemies, environmental hazards, and even weather effects have started showing up. The combat scenarios become more elaborate, brutal, and can require a lot of headlong tackles before you figure out just what you're going to have to pull off to get through it. There is a certain attitude that underlies zX. 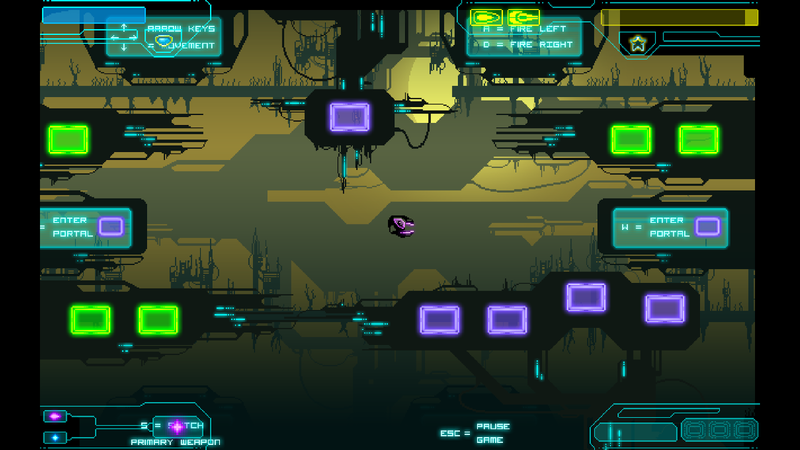 Menus are sparse, and feel like they were reluctantly included just because the player needs a place to set the volume. Instructions are bluntly expressed in the background. When you get hit, bright red exclamations such as, "YOUR MOTHER!" and, "BUMGRAVY!" fly out of your ship. These seem sort of out of place in the first few levels, but pretty quickly become an accurate mirror to how you feel about the situations the game drops you into. You may not have realized it at the time, but there was a reason that those first levels seemed too easy. It's because, along with the pile of facts dispersed on curt signs, those were your tutorial. This game has no hand holding, nor any getting between the player and the gameplay. There are two difficulty levels: Sane, and Insane. Sane nearly drove me nuts, and Insane killed me in the tutorial. Be ready to sweat. retroFuture knows what kind of game it's making. Even though it's clear where zX has cribbed many of its mechanics and ideas from, it's also evident that it knows why it's cherry-picking those elements from those sources. They also seem to know how to put them to good use towards an overall very tight and exciting experience. It can be frustrating at times, but the short levels make it easy to just drop it and take a break. The lack of polish that comes with an early WIP build of a game from a pretty green developer is entirely evident, but as development continues I expect that feeling will get massaged out. 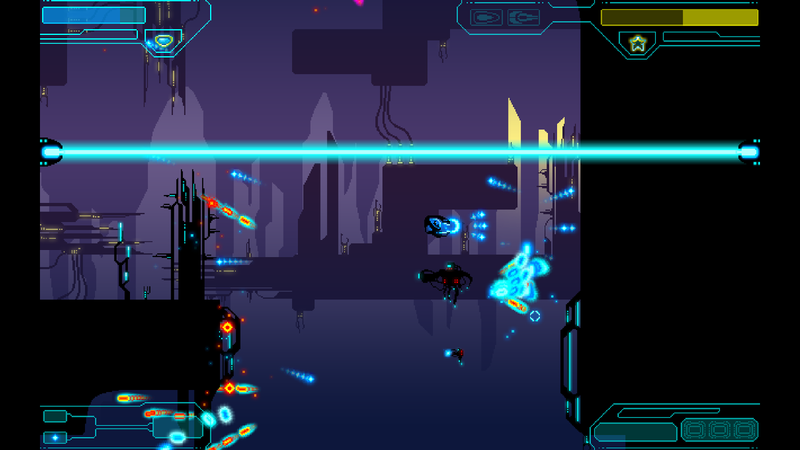 And it doesn't change the fact that zX is glowing with so much of the earnest love that retroFuture has for those original games, that it can't help but be a package that anyone looking for classic arcade action will want to get their hands on. 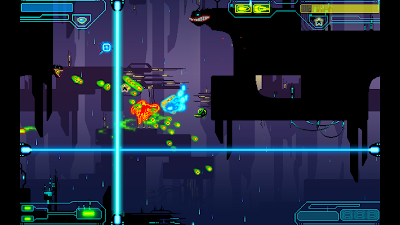 Download the demo here (from the game's Steam Greenlight page). I pretty much concur with Nick's write-up above, but have to say in addition that I found the gameplay to be slightly reminiscent of the Dreamcast classic Bangai-O, one of my personal favourites on Sega's final foray into the console market. 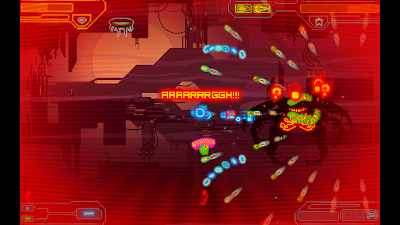 Also, I feel that the game's focus on melee combat differentiates it from many shmups - you really need to master the blade attacks to get anywhere in zX. 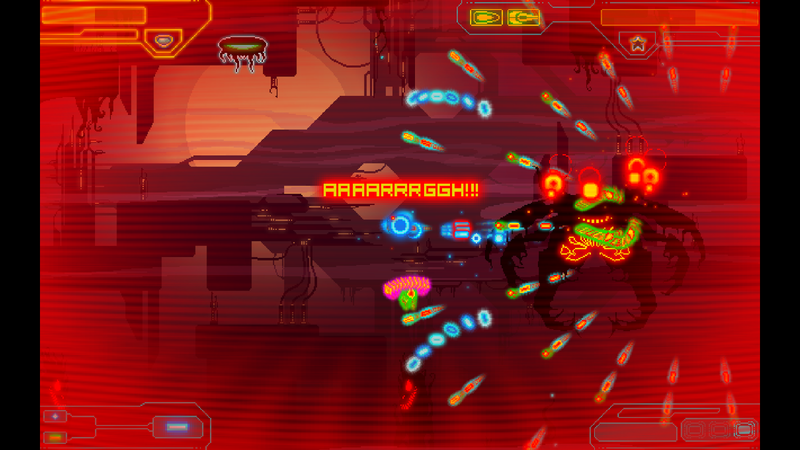 This feature and the combination of awesome soundtrack and glowy neon visuals totally won me over. 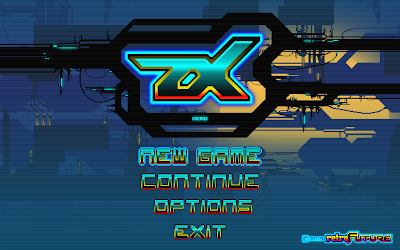 zX feels like an ambitious project for a two-man team, but after a recent conversation with retroFuture it seems that the majority of the work is done (close to 80-90%). The potential here is huge, and I wholeheartedly wish them every success. When will we see the release? This is Michael, zX's developer. 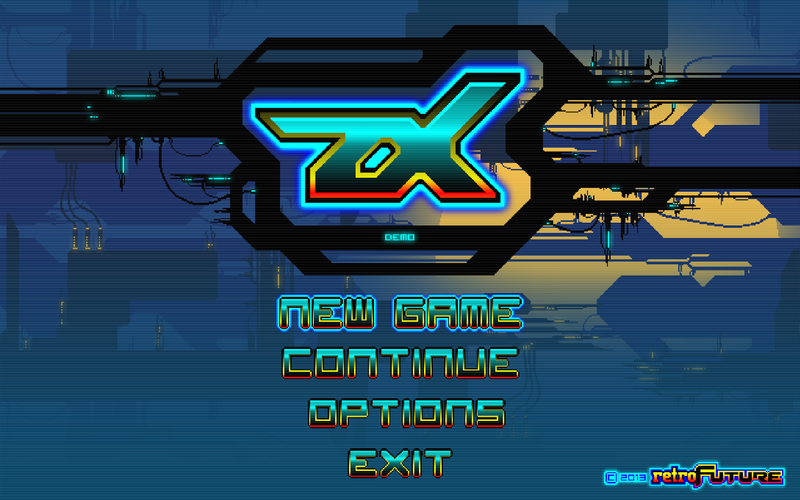 zX will be finished before the end of the year. 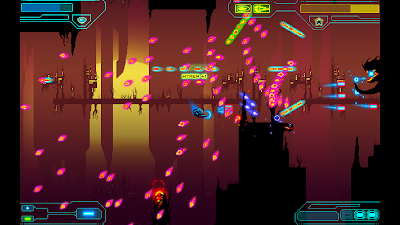 Currently working on boss monsters, saving system, music polishing and a more accessible tutorial system. Getting it greenlit for Steam is the big challenge at the moment. It is also going to be submitted to GOG upon completion.